Fish Report - Starting The Year Off With A BANG! Hello everyone, since we could not up date you on our daily events, Big “D” did a report every night and now he’s sending it out. Hope you enjoy it. Hello everyone; We’ll lets start with the weather, mother nature put some rain on us. We had rain from midnight, and with rain you get wind. We had 18 to 22 knots of breeze today. We didn’t troll for Wahoo today, because of the weather, but the quality of the Yellowfin continues to be excellent. We had 4 over 200 and one over 300 today. Big fish honors goes to Butch Brown, with a 338 pound Yellowfin tuna. Butch caught this fish in the dark on a live skipjack. The battle lasted almost 2 hours. This is Butch’s second Yellowfin over the 300 pound mark. Most people know Butch for his Largemouth fishing, but he’s a very good tuna fisherman also. We also had another 5 fish over 200 pound today. Lucky anglers today, Wayne Tanimine with a 228 on the chunk, Ron Kusumi with a 204, Lloyd Henry with a 210, Randy Makiyama with a 253. The rest of the Yellowfin were in the 70 to 100 pound range, with a few smaller one’s today. Trying for flyers again tonight, so until fingers and key board meet again. Wish us luck, team R/p. Hello everyone; Not much I can say about today fishing, just the beat goes on. We didn’t troll around much for Wahoo today, but we did manage a few for the RSW tank. Yellowfin tuna continues to be good, with fish up to 228 pounds. Most of the fish today were in the 50 to 80 pound range, a few in the 120 to 180 range. Jere Crossett hasn’t been long range fishing in years, but he hasn’t lost it. Lucky anglers today, Ron Kusumi with his second fish over 200 pounds. Ron’s fish came in at 201 pounds ad Randy Makiyama with his second fish over 200, Randy’s fish came in at 238 pounds. Fishing for bait has been very tough, and with another boat here, it could be a long night tonight. With 3 full days left to fish, we are having a great trip. Another day like today, we might be getting into the next RSW well. So until tomorrow, wish us luck, team R/p. Hello everyone; Well our weather is about the same. Fishing was a bit slower today, with the quality being smaller. We did have one fish over the 200 pound mark. Lucky angler was Allen Hartman, with a 230 pound Yellowfin tuna, caught on a live skipjack. We had a handful of /Wahoo, and most of the Yellowfin were in the 40 to 70 pound range, with a few in the 120 to 150 range. We have two more full days left. We made a tank of bait tonight, and will give it the old collage try again. So wish us luck, team R/p. Hello everyone; Well lets talk about our last day of fishing. Started out a bit slow, but by the end of the day, we finished our trip with a bang. We had another 2 fish over the 200 pound mark. Lucky anglers, Ron “The Shogun” Watanabe with a 213 pound Yellowfin on the kite, and Susan “wait to the last minute” Gentry, with a 245 pound Yellowfin tuna, also caught on the kite. We had good fishing after lunch on 50 to 70 pound fish, and another group of fish in the 90 to 120 pound range. We had a decent Wahoo fishing on the anchor today. We finished up the trip, and it was another one for the books. 208 Yellowfin tuna, and 124 Wahoo for our happy anglers. We are headed for home and will arrive on the 18th of January. So until tomorrow, wish us luck on the weather, because it’s fantastic today. Team R/p. It’s not much more I can say about the trip, just WOW!!! 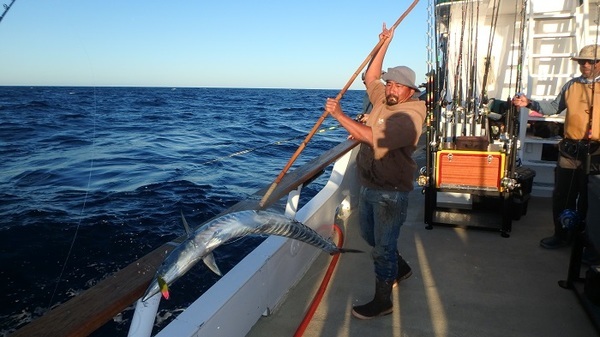 We had 208 Yellowfin tuna, which 19 were over 200 pounds and 0ne over 300, and 124 Wahoo. Our weather today is just gorgeous, with 5 knots of breeze, clear skies, and sunny. The crew cleaned the boat today, and now we are having open faced Turkey sandwiches. So I will close for now, and we will keep you posted on our upcoming events. Team R/p.